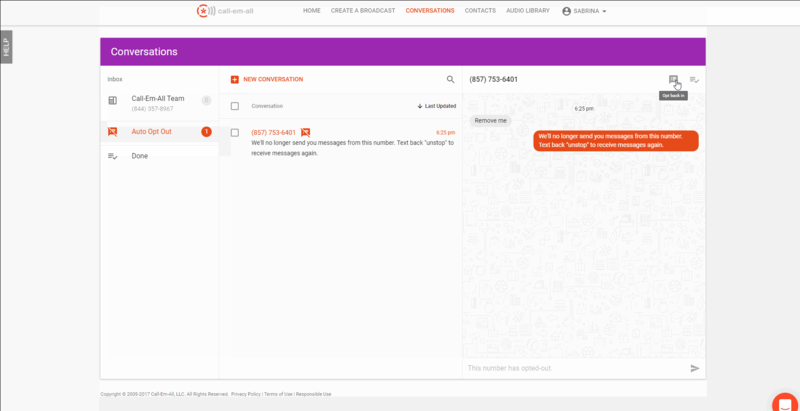 Using the power of machine learning, our system will "automatically" detect inbound messages from your contacts which clearly demonstrate intent to stop receiving your messages and opt them out from your account. Not only does this save you time, it also ensures you are communicating with a highly engaged audience. "Please remove me from your list." "This is the wrong number." "Please do not text this number." "How do I opt out?" Our system will also continue opting out any number that responds to your text message with a standard opt out term: STOP, END, CANCEL, or UNSUBSCRIBE. The Call-Em-All account holder can also opt out phone numbers directly within the account. You can learn more about both of these options here. From the CONVERSATIONS tab in your account, you are able to view all of the messages that have triggered an auto opt-out by clicking the "Auto Opt Out" folder on the left side of your page. If you think we got it wrong, you can simply click the "opt-in" icon above the conversations and your contact will resume receiving your messages.